These are exceptionally late. I took these shots of the Canada Day fireworks, but have only now had time to process them. Fireworks can be tricky to photograph as you need to get your setup and focus while there is still good light and try to anticipate where the fireworks will be later on. For these shots I set up my tripod while there is still enough light to focus correctly. To get the focus I used the zoom feature in live view to focus on the grain elevator in the harbour. That’s where the fireworks are set off from, and since they’re mainly shot straight up, I knew the focus should be good at that point. As fireworks can shoot in any number of directions, I used a fairly wide frame and set my aperture to F8 to increase my depth of field without requiring an overly long exposure time. Very neat shot Mike. 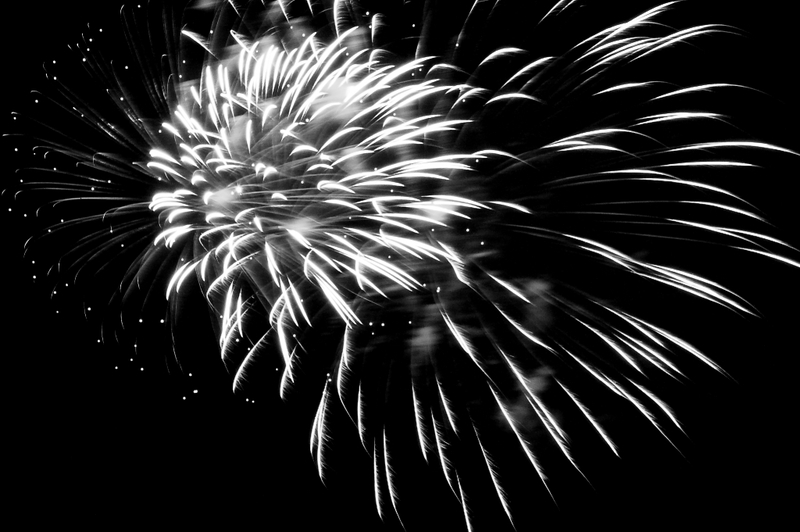 Actually I don’t think I have ever seen a B&W fireworks shot – wasn’t very memorable if I have. Works really well. Thanks Scott! I had a number of shots that looked more like the typical fireworks shot, but cropping this one and doing the B+W conversion really stood out for me. Something really different that the usual fair. Glad it resonated!